Design:Pink White Twill Design:Pink White Twill ❤SMART DESIGN❤ It's sealed by drawstring which makes it very easy to open. The bag will lay out completely flat when you open it. All of your kin-care products, makeups and brushes. 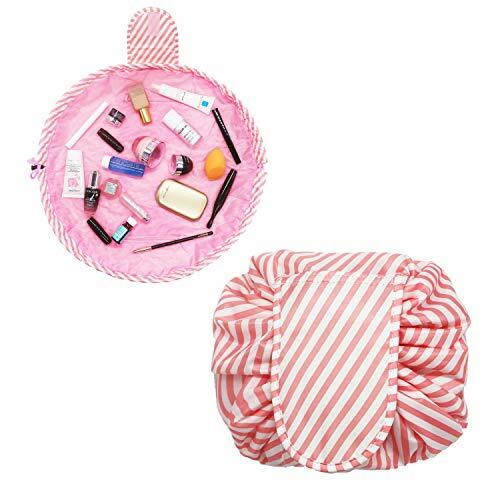 will appear at once.You don't need to dig and dump from the traditional make up bag. ❤FUNCTIONAL POCKET❤ We design a small pocket outside the bag and two zipper pockets inside.It will be great helpful when you pack the small beaty tolls,like sharp cutting eyebrow clip, cosmetic cotton and so on. Carrying small items will not be a trouble anymore. ❤TRAVEL ESSENTIAL❤ This cosmetic pack's capacity is large enough to store all your daily essentials when traveling. And it's portable lightweight toiletry bag can be put in easily your backpack or luggage easily. Perfect for organizing your personal, household, and travel items, suitable for both home and travel. ❤WATERPROOF❤ Made of waterproof fabric which is easily wiped clean and protect items from wet. ❤WHY CHOOSE US❤ We focous on supplying upscale daily packs.If you don't satisfied with our product, just return it and you will get a full refund from us. Any questions or comments are welcomed, we take every feedback seriously.